We are half way there. So, was Yamani right? Few in today’s oil industry think so. In January, Exxon predicted that oil, gas, and coal will still meet 80% of the planet’s energy needs in 2040 and beyond. This view is shared throughout the industry and most of the energy commentariat. Reassurance is as abundant as oil. The boundaries of the oil industry’s comfort zone are being clearly marked. The sharp fall in oil prices in nothing to worry about. As investment in new production falls – $400 billion less than a year ago – supply will be constrained. Inventories will be run down, Prices will rise again. The market will come back into balance and life will go on as before. There may be some fall out among smaller producers but the big guys will tough it out. This comforting view is shared by everyone from BP and Shell to the International Energy Agency. If they are right, then Sheikh Yamani will have been wrong, not about the oil in the ground, but about the buyers. They will be there in 2030 just as they are now. The international oil companies regularly publish their projections of how global energy demand will evolve over the next thirty years. Their brightly coloured charts all show pretty much the same picture as do those of public bodies such as the International Energy Agency. Global primary energy demand is projected to reach about 17 billion tonnes of oil equivalent (btoe) by 2035. Of this, about 13 btoe will come in roughly equal proportions from coal, oil and gas. Renewables and hydro will provide about 1.5 btoe each and nuclear 1.0 btoe. This data is the foundation of the fossil industries’ argument that it is unrealistic to imagine that renewables can be scaled up fast enough to decarbonise the economy. Their contribution would need to increase 800% in thirty years. Impossible. Expressing energy demand data as btoe handily allows you to compare each of the different energy sources on the same basis. Using a common metric means you can quickly judge the relative importance of each of the energy sources. This lets you to get a realistic view of the scale of the decarbonisation challenge. Except that it doesn’t. It actually conceals more than it reveals. These charts are responsible for serious misjudgments by policy makers and investors. They greatly overstate the difficulty of keeping the climate safe while maintaining energy security. Different energy sources deliver energy services to consumers in very different ways and with very different efficiency. Almost all of the renewable primary energy ends up providing consumers with useful energy services. This is not true for fossil fuels. Much of their primary energy ends up as waste heat. The amount varies depending on whether it is coal, oil or gas. Oil, for example, is primarily used for transport, about 80% of its energy content ends up as waste heat. Overall, only about 40% of the primary energy from fossil fuels ends up delivering useful energy services to consumers. 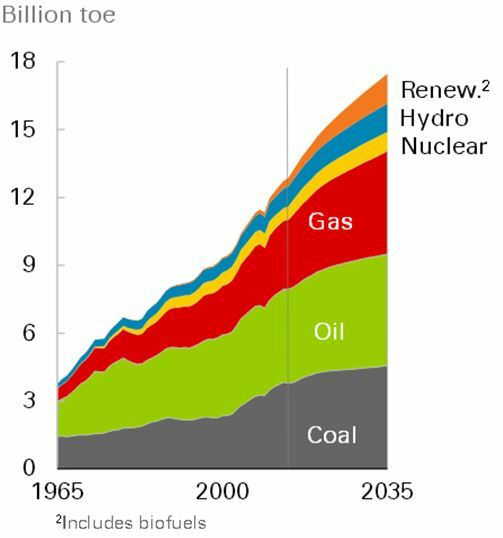 This makes the scale of the decarbonisation challenge look rather different. The actual amount of energy services that renewables need to deliver to eliminate fossil fuels is the equivalent of some 5.2 btoe. That is an increase of only 350% – less than half of what the fossil industry would have you believe. Much more achievable. In the real energy world you cannot convert barrels of oil, tonnes of coal or cubic feet of gas into anything other than useful energy services and waste heat. Manipulating numbers is not the same as manipulating real commodities. As Bertrand Russell pointed out, logical operations that are valid at one level of reality may not be valid at another. You learn as a child that you cannot add apples and oranges even though you can add the pence that you pay for them. I do not know the reason why the fossil fuel industries choose to present their data in this form. I do know that it is giving them a false sense of security about their future. To a growing range of businesses in this digital age the waste heat looks like a massive opportunity. As the leaders of the fossil industries, and their shareholders, think about the outcome of COP21 they may not be looking in the right direction to see the coming disruption.